"There are no precise figures, but last January Brazil was just behind the United States, which had 2.3 billion phone calls and messages spied." 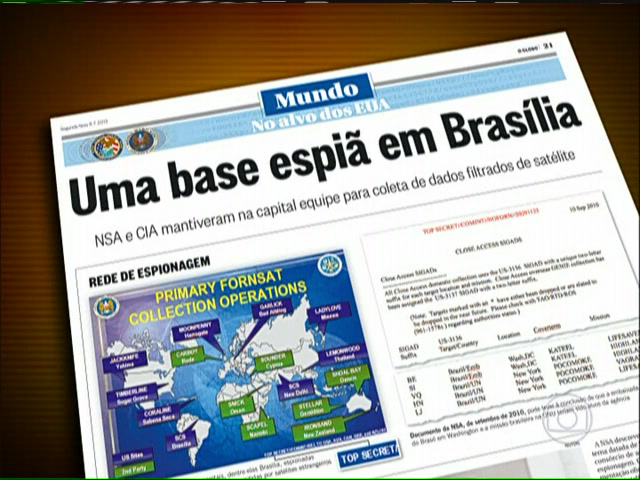 "A similar article, using the same set of documents, was published in Brazil's O Globo a week later, reporting the NSA's collection of the data for more than 2 billion calls and emails in Brazil in a single month. Another article, in the Indian daily the Hindu, reported on bulk collection of the data of calls in India based on the same document set." In the first instance it would seem that 2 billion was the Aggregate Brazil total (calls and emails), but in fact it was the US DNR total (calls and text messages). I caught this because i was trying to reconcile the color of Brazil vs Germany, with Germany apparently having a lower total but a more intense color. Subject: Translating Telephone metadata records to phone calls. 1) It is possible for a new record to be generated along each switch along the call's path. 2) Multiple taps on a call's path, will of course generate multiple records for the same call. In a country like Afghanistan or Iraq, you can pretty much count on the entire infrastructure being bugged many times over by multiple means. The same calls therefor get picked up many times. Which is how we get to 20 billion call data records in a country that doesn't make nearly that many calls. 2a) The NSA may have some de-duplication capability, however it is likely not perfect. 3) Double counting: If someone in Iran calls someone in Brazil, that call could be picked up in both places, and increase each country's total. If the overall count equals the sum of the individual countries, there is double counting involved in the computation of the total. In some ways the NSA is it's own worst enemy to say that the reports of 70 million calls in France being logged per month is inaccurate without explaining any of this. However, it isn't really better to say that each call on average generated 3 metadata records which were on average picked up twice apiece (ie: "it's only 11.7 million calls we bugged"). I did not include the total in my original email, because does not reflect the totality of the NSA's operation. If we take a look at the Map view, we actually have the true total: 124.8 BILLION. The map view seems to be captured on Jan 8, 2013, and captures reflects the last 30 days, just like the org views. (Declassify date: Jan 1, 2032), and is giving is some totals. There ought to be an Org view for each of the countries on the map view. According to the FAQ, the org views appear to have the ability to drill down further than we've seen so far. The caveat here is the the FAQ warns that the totals on the Org and map views are not the same, be that as it may, we still should have some idea based on the published images. Subject: Beneath the blackouts on "close access SIGADs" in LeMonde, etc. It looks to me a lot like the Le Monde stories will follow the path of the Brazilian and Indian stories. It has occurred to me that this same story can also be told for many, many other countries: der Spiegel has already published BOUNDLESSINFORMANT graphs for the following: Germany, France, Italy, Spain and the Netherlands. If we take careful measurements of these graphs, and work out the appropriate scaling, we can determine how many telephone metadata records we have in each of these countries over the same 30 day period (DNR). The accuracy will be plus or minus 1 pixel, scaled appropriately. I have enclosed my chart. Publish if you will, there's nothing here that a person with a spreadsheet, a photo editor, and a lot of time couldn't have worked out, and for that reason, it's not encrypted.